I don’t like to eat it, but for decor you can’t beat it! 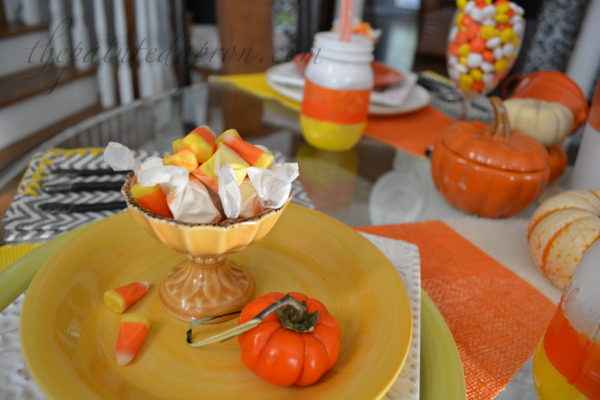 Buckets spill candy corn, taffies and more! 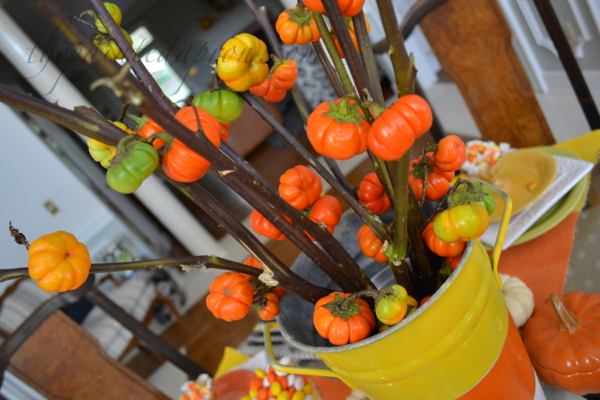 Than a Candy Corn Party with lots of cold beer good cheer? I love candy corn, this piggy eats it too:@) As a matter of fact, it’s a favorite of #1 son so it’s on the shopping list for today. Your table is very cute and colorful! 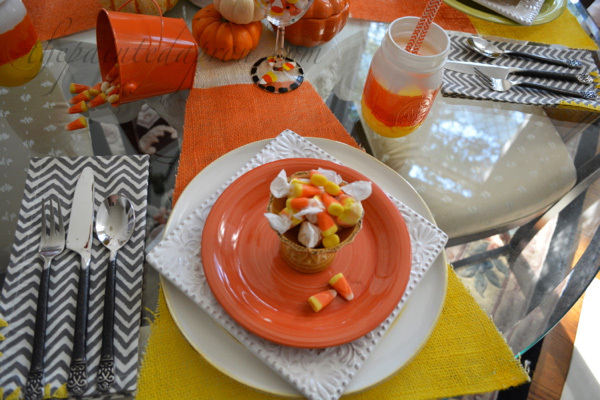 We had people for dinner a couple of nights ago and I put a little cauldron of candy corn at each place. To my surprise most got eaten. 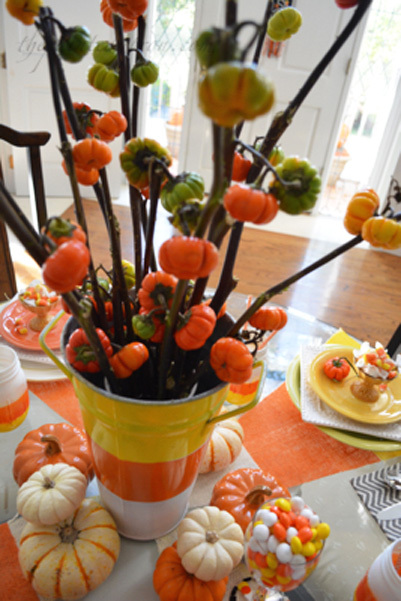 Pretty table, and I am with you – rather decorate with those sugar bombs than eat them. 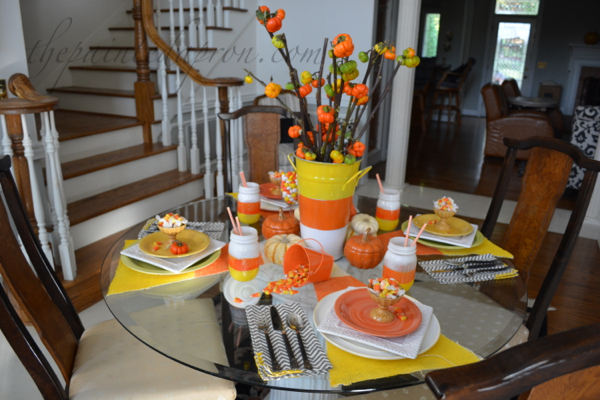 Cute how you made a little rhyme to show your table as it was building the tablescape. What a fun and festive look for this time of year. Love that you changed the beer to cheer…I don’t drink beer, but I imagine that it wouldn’t taste very good with candy corn! It’s always fun to see what you’re doing on your table. Have a good Sunday! Love all your pretties for this party. The colors are perfect and I the little pumpkins are adorable. I love candy corn so I don’t buy it! 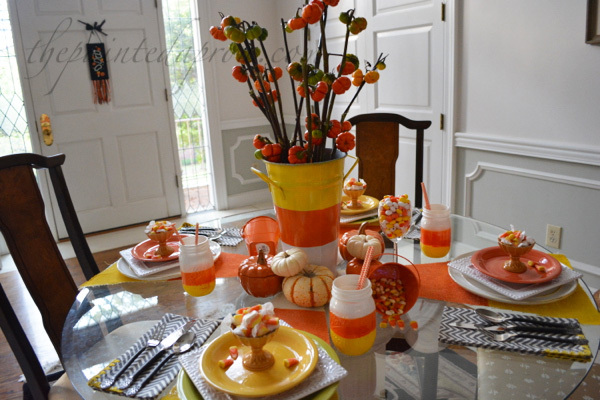 Jenna, I love it all, but my favorite is the candy-corn-painted-mason jars! That’s a cookbook must!! Oh, I love this table. 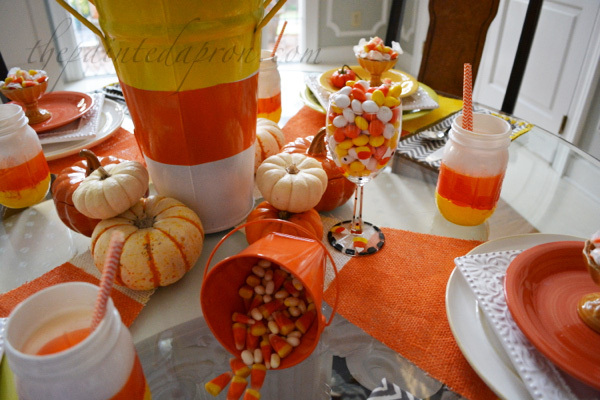 The candy corn theme is so fun. You have done a marvelous job with this table. 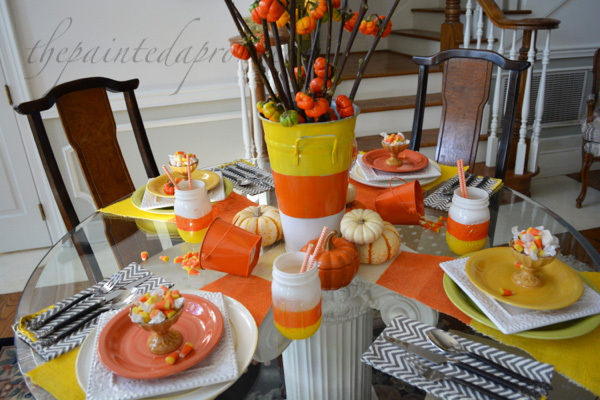 I am actually going to be doing a candy corn table in a couple of weeks. So adorable! I love candy corn and even enjoy eating it. 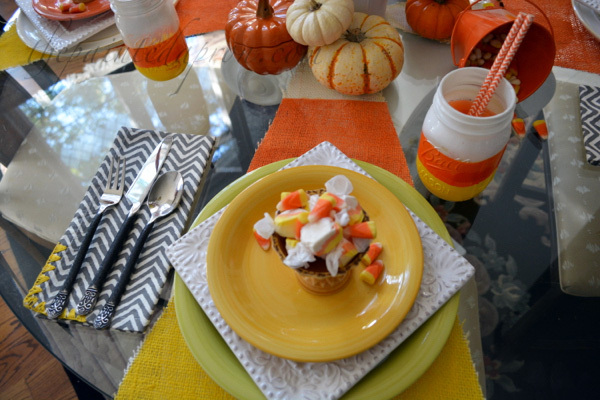 Your place mats have come in real handy for Halloween tables. Candy galore is my kind of table anytime! I am crushing on your table!!!! Candy corn colors are one of my favorite Fall patterns. 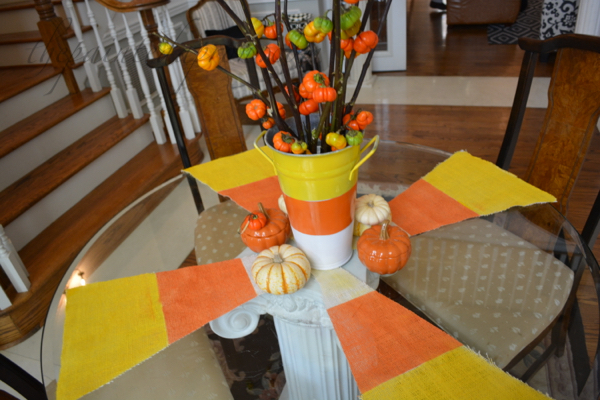 ~adore~ I just posted my own collection of candy corn projects and yours is turning my wheels to create more! What a fun and neat party! I am with you, Jenna….not a fan of candy corn! 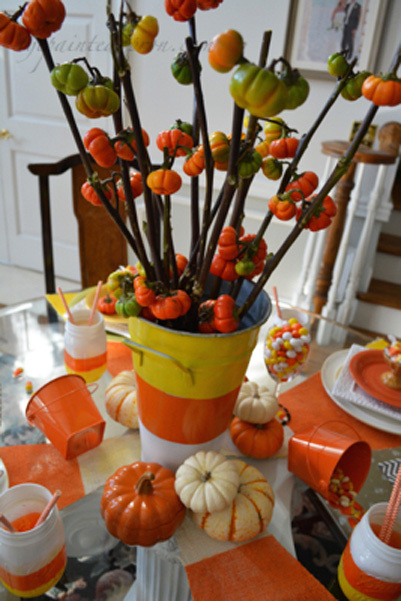 But your table is such fun-creativity galore! How cute and festive, love it! Thanks for sharing at Merry Monday, hope to see you again next week! 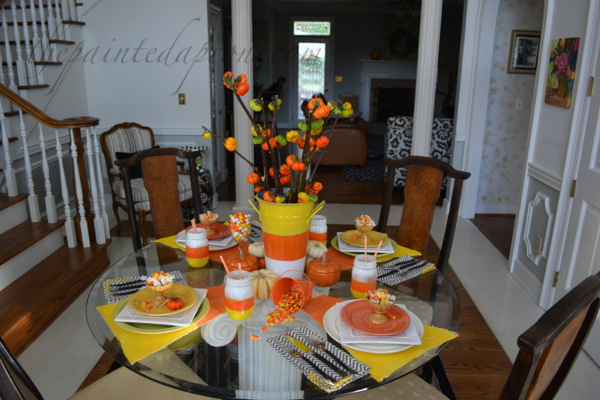 I love how you decorated everything with the candy corn theme! 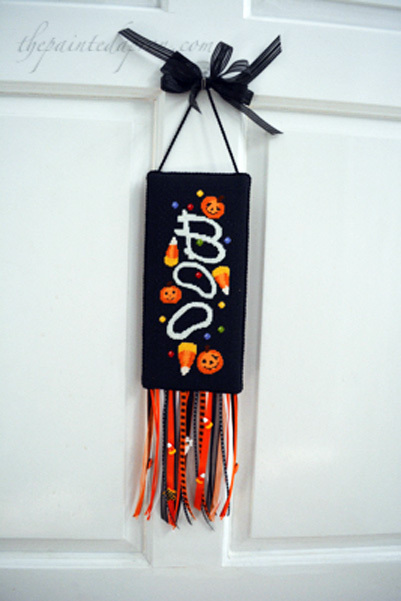 Just perfect for Halloween.